Labelservice is one of the premier digital label suppliers in the UK. The advent of digital labelling is the most exciting development in our industry in years. It has allowed smaller and multi sort runs to become financially viable, whilst creating opportunities for brand new work. In short, it is changing the way labels are being purchased and used. No plates – if you spend hundreds or even thousands of pounds every year on printing plates, this is a thing of the past. Digital is a plateless technology. Large stockholding? - just in time production means you no longer have to tie up cash in high label stock. Small runs? - Minimal setup time now you are not paying an artificially high price for short label runs. Seasonal or Promotional runs? - The flexibility of digital means you no longer have to plan months in advance. Last minute artwork changes can be catered for without affecting the delivery time. Own Brand and Private Labelling – Digital labels from Labelservice allows you to offer full colour, retail quality labels to your client’s own brand identity, in runs short enough to cater for small production batches. Press Proofs and Prototypes - No other technology allows for free of charge press proofs or prototype runs, on the actual material and finish you specify. This is perfect for photo shoots, product launches, or if you wish to test the label on your product before a full production run. Startup Businesses – No other technology allows you to purchase low label quantities of such quality, without cost or origination penalties. Just In Time Deliveries – If you have to plan your production around when the labels are arriving, think again. Digital labelling allows you to order labels with a lead time of typically just 2-3 days. Regular Production Slots – If you take regular deliveries of labels we can cater for this by allocating one or more weekly production slots. This way you know you are having label deliveries at the same periods every week, in many cases offering next day delivery. Problems With Flexographic Quality – Whilst longer run technology can offer superior costs per label, it often has issues with quality on full colour work. Very high quality photographic images can experience hard edges on tints and graduated screens. There is no better print quality than digital. Multiple sorts – If you require multiple label types in a single run, this is easily achievable with digital technology. Plateless printing offers full flexibility to change designs during a single production run. You do not have to commit to equal quantities, and you can even have different sorts on the same roll. 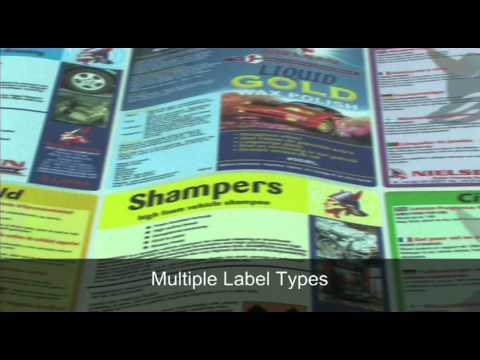 Variable / Unique Coding – Digital printing allows you to feature unique, sequential and variable coding on your labels, and unlike other technologies, these are produced in a single press pass. The coding does not just have to be single colour – every label can be different. Variable Imagery – Change your entire marketing strategy and use the label to convey new and upcoming promotions. Many businesses are moving away from the routine of ordering repeat labels, and utilizing the full power of digital to change the marketing message each time they despatch their products. In most cases the label is the first thing your clients notice, digital labelling offers you the chance to sell more to your customers at the point of purchase, without any additional marketing spend. Window Stickers - Window stickers can now be printed digitally, saving money on plates, as well as the high cost of other printing methods such as screen printing. As with other digital labels, variable data and imagery can be printed as standard, and they can be printed on both the face and reverse. Peel and Reveal / Booklets - Popular label constructions such as peel and reveal and booklet labels can now be printed digitally, again with zero plates, minimal set up and fully variable information throughout. This is proving a massive success in the on pack promotional market, where competitions with unique coding and winning numbers can be printed underneath the top layer, or even on the adhesive. Materials, Adhesives and Decoration - Digital labels can be printed on a wide range of materials. Standard white and colourwashed papers, or special papers such as antique and rustic materials. Filmic substrates can be used such as white or clear PP, PE or vinyl. Security evident materials can be catered for as well as high industrial polyesters and aliminium foils. For additional decorative effect we can add foiling, embossing, resin domes and textured and pattern varnishes. Durability and Overprinting - All digital labels can be varnished or laminated to protect against damp or wet conditions, scuffing and scratching or more industrial hazards such as oils and solvents. They can also be overprinted by other printing technologies such as thermal transfer. Metallic printing – Labelservice can now offer metallic labels that up until now were unavailable with digital printing. We can supply a virtually unlimited array of metallic colours and decorative effects. This new technology is opening up the doors for digital labels in several new markets, such as cosmetics and car care products.